Suppliers were the winners in the final quarter of 2009 thanks to Norway's Kongsberg Automotive Holding ASA and France's Valeo SA. 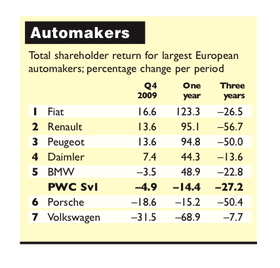 The shareholder value for European partsmakers increased 7.30 percent in the fourth quarter, according to the Automotive News Europe/PricewaterhouseCoopers Transaction Services Shareholder Value Index. 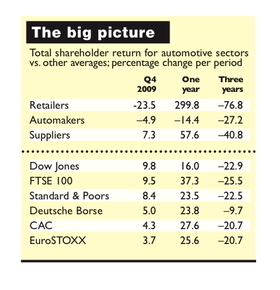 The quarter was not as kind to automakers and dealers. Automakers declined 4.91 percent while dealers fell 23.47 percent. All three groups of automotive stocks were beaten in Q4 by the Dow Jones Industrial Index -- up 9.76 percent -- and the UK's FTSE 100, which rose 9.53 percent. Fiat S.p.A.'s value to shareholders increased a sector-leading 16.61 percent in the fourth quarter, according to the Automotive News Europe/PricewaterhouseCoopers Transaction Services Shareholder Value Index. In the third quarter Fiat was up by more than more than 20 percent. Fiat was followed by the France's Renault SA, which made a gain of 13.60 percent, and PSA/Peugeot-Citroen SA, up 13.58 percent. All three mass-market brands benefited greatly from government-sponsored scrapping incentives that paid people thousands of euros to trade-in their old cars for newer, less-polluting models. Fiat also benefited from announcing in December that it would spend 8 billion euros ($11 billion) in investments and research over the next two years. Two-thirds of that investment will be in Italy. The automakers in the table that failed to provide positive returns were BMW, AG, Porsche Automobil Holding SE and Volkswagen AG. VW was hit hardest, with a decline of 31.45 percent. The drop resulted in a decline of 68.95 percent in the group's one-year performance. VW's shareholder value has been hurt by the failure of Porsche SE to complete its takeover of the company and VW's decision to purchase Porsche SE's automaking arm, Porsche AG. VW spent 3.9 million euros for a 49.9 percent stake in the sports car maker in December. Despite the decline, Jason Wakelam, leader of PwC UK's Automotive Transaction Services, is bullish on Europe's largest automaker. “Volkswagen has continued its focus on developing strong brands, partnering in developing markets and increasing global volumes through geographical expansion, which will stand it in good stead in the years to come,” he said. 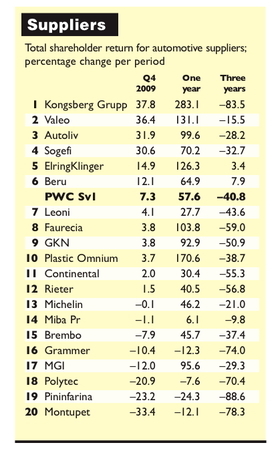 Thanks to strong gains by Norway's Kongsberg Automotive Holding ASA, France's Valeo SA and Germany's ElringKlinger, Europe's suppliers finished the year with the best performance of the three auto groups tracked by the Automotive News Europe/PricewaterhouseCoopers Transaction Services Shareholder Value Index. “Bucking the trend in Q4 were Kongsberg, which benefited from a number of significant contract wins, and Elringklinger, which was successful in expanding sales in Asia and has commenced work on two new production facilities in China,” said Jason Wakelam, leader of PwC UK's Automotive Transaction Services. Kongsberg Automotive rebounded nicely in the fourth quarter with a gain of 37.80 percent in shareholder value. In Q3, the seating and engineering supplier was one of two partsmakers to suffer a decline in shareholder value. The other was Austrian plastics specialist Polytech Holding AG. Kongberg benefited from a capital increase in October that eliminated most of its credit risk. Some analysts forecast growth of more than 70 percent in Kongberg's share price in the near term. Valeo's shareholder value rose 36.39 percent in the quarter. The lighting, electrical and thermal systems maker was helped by announcing that it was raising its sales growth objective for the quarter to about 17 percent year-on-year. It said the improvement was due to vehicle scrapping schemes in Europe and rising auto production in Asian markets. The quarter was not good for eight of the 20 suppliers monitored by ANE and PwC including Italian coachbuilder and design house Pininfarina S.p.A and Polytech. 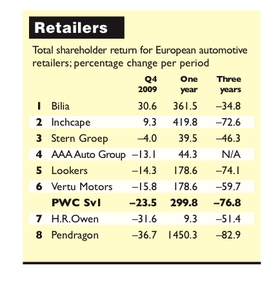 Sweden's Bilia AB was the clear winner in the fourth quarter among dealer groups tracked by the Automotive News Europe/PricewaterhouseCoopers Transaction Services Shareholder Value Index. Shareholder value at Scandinavia's largest dealer group increased by 30.60 percent in the final three months of 2009. Bilia benefited in Q4 by reporting a 66 million kronor (about $9.1 million) operating profit in the third quarter compared with a 28 million kronor loss in Q3 2008. “Demand for new cars is increasing in Sweden and Norway, but is still depressed in Denmark. The slightly improved market situation, along with substantially lower costs and tied-up capital, have led to greatly improved results. The positive development of the Swedish operation is particularly gratifying,” Bilia CEO Jan Pettersson said in a statement. Bilia's value to shareholders increase nearly 35 percent in Q3 2009 after a triple-digit rise in its return in the second quarter. The UK's Inchcape Plc also made a Q4 gain in shareholder value, up 9.28 percent. The company was helped by an announcement in late December that its expects its fourth-quarter results in Britain will be better than expected thanks to a rush for expensive car purchases before an increase in value-added tax from 15 percent to 17.5 percent. Jason Wakelam, leader of PwC UK's Automotive Transaction Services, foresees a difficult year for European retailers.